We present a lentiviral technique for genetic manipulation and visualization of single olfactory sensory neuron axon and its terminal arborization in vivo. Sadrian, B., Chen, H., Gong, Q. Lentivirus-mediated Genetic Manipulation and Visualization of Olfactory Sensory Neurons in vivo. J. Vis. Exp. (51), e2951, doi:10.3791/2951 (2011). Development of a precise olfactory circuit relies on accurate projection of olfactory sensory neuron (OSN) axons to their synaptic targets in the olfactory bulb (OB). The molecular mechanisms of OSN axon growth and targeting are not well understood. Manipulating gene expression and subsequent visualizing of single OSN axons and their terminal arbor morphology have thus far been challenging. To study gene function at the single cell level within a specified time frame, we developed a lentiviral based technique to manipulate gene expression in OSNs in vivo. Lentiviral particles are delivered to OSNs by microinjection into the olfactory epithelium (OE). Expression cassettes are then permanently integrated into the genome of transduced OSNs. Green fluorescent protein expression identifies infected OSNs and outlines their entire morphology, including the axon terminal arbor. Due to the short turnaround time between microinjection and reporter detection, gene function studies can be focused within a very narrow period of development. With this method, we have detected GFP expression within as few as three days and as long as three months following injection. We have achieved both over-expression and shRNA mediated knock-down by lentiviral microinjection. This method provides detailed morphologies of OSN cell bodies and axons at the single cell level in vivo, and thus allows characterization of candidate gene function during olfactory development. This procedure is biosafety level 2, therefore all the following preparations are made in a biohazard hood where the microinjection procedure is performed. Prepare and preheat a 37°C waterbed: Fill a plastic storage bag with water – seal and set on an emptied heating block incubator. This will allow mice to recover following injection. Fill a biohazard waste container with 10% bleach to a suitable volume for immersion of all waste from this procedure. Prepare a small open dish of 70% ethanol and a second dish with sterilized ddH2O and place in the biological safety cabinet. Sterilize a 5μL capacity Hamilton syringe with a 33-gauge needle by spraying down the body and needle with 70% ethanol with the plunger pulled out all the way. Repeatedly aspirate ethanol from the dish and eject it all the way out at least 5 times. Rinse the syringe cartridge by aspirating and ejecting sterile water at least 5 times. Place syringe safely aside in the culture hood and allow it to dry. Remove viral stocks from -80°C freezer storage and place on ice to allow thawing. Microinjection requires 2μL of virus stock per mouse at a titre of 109 infectious units/mL. Lentiviruses can be obtained from commercial sources or produced in the lab according to the established protocol (Lois et al., 2002). Prepare an injection stage that provides an area raised above the hood surface - can use a 10cm culture dish covered with a sheet of Kimwipe. Arrange alcohol wipes near the injection station. All animal procedures performed in this method are done according to IACUC approved guidelines. The Mus musculus strain C57BL/6J is the animal model used in all experiments demonstrated here. Anaesthetize mouse pups by hypothermia by taking a mouse pup (P0-P3) out of the cage and putting the pup on a cut-open glove on ice for 5 minutes. While waiting for the pup to be fully anesthetized, aspirate 2μL of viral stock into the sterilized Hamilton syringe. Place the mouse pup on top of the injection stage. Gently pull skin away from the top of the head at the ear toward the top of the neck. This should provide a taught skin surface over the nasal cavity and will ease injection. Insert needle through the top of the nasal cavity about 3mm below the skin surface to reach the olfactory epithelium. Microinject 0.5μL of virus solution per shot, choosing two sites per side, both left and right (four injections total per mouse = 2μL of virus needed). Injection sites should be staggered apart from one another. For targeting of proper injection sites, search the dorsal skull surface for the outline of the olfactory bulb. This line is barely visible at birth through the semi-translucent skin and skull. To make two injections per side, aim one injection just rostral to one bulb outline at a medial axis. Make the second insertion lateral to the bulb outline, yet make sure to angle the injection medially so that you may reach the olfactory epithelium that resides ventrally underneath the bulb. Avoid penetrating the olfactory bulb! Blot dry any residual virus solution or blood that may escape from the injection site or nostril openings using a Kimwipe. Immediately dispose of Kimwipes in the diluted liquid bleach biohazard container. Place the injected mouse onto the waterbed incubator. Repeat steps 1-4 for all mice to be injected, remembering you will need about 2μL of virus stock per mouse. Let mice recover on the waterbed incubator for 30 minutes before returning them to their original nesting cage. Dispose of microinjection stage, sanitizing wipes and any extra cleaning paper products in the liquid bleach biohazard disposal. Clean the Hamilton syringe by repeated aspiration and ejection of ethanol and then water as done in the preparation steps. Allow the syringe to dry. For maximum transduction efficiency repeat this procedure again in 4 hours. Infected OSNs may be visualized throughout the length of the cell in as few as three days. Sacrifice the injected mouse at the desired time point and perfusion fix the tissue with 4% paraformaldehyde. Dissect out the OB. Incubate in paraformaldehyde overnight and then 30% sucrose in PBS overnight. Embed in O.C.T. embedding medium on dry ice. Coronal OB sections are obtained at a 60μm in thickness using a cryostat. Sweep bulb sections into a 10cm culture dish with 5mL 1x PBS (pH 7.4). Sections should be kept floating in PBS to allow O.C.T. to dissolve. Transfer floating sections and PBS into a 50mL conical vial. Allow sections to settle to the bottom of the vial. Vacuum off PBS without sucking up any sections. Rinse tissue sections with 20mL PBS. Repeat settle and vacuuming steps. Resuspend tissue with 10mL PBS and transfer floating sections to a 15mL conical vial for immunostaining. Once tissue sections have settled, vacuum off PBS supernatant without disturbing tissue. Resuspend sections with 0.3% Triton X-100 in 1x PBS, pH 7.4 (PBS-Tx) allowing detergent to perforate cell membranes. Incubate for 10 minutes at room temperature. Vacuum off supernatant and repeat incubation with PBS-Tx twice. Incubate tissue sections in 10mL of blocking solution (5% horse serum in PBS-Tx) for two hours at room temperature. Rinse blocking solution at least twice with PBS-Tx for 15 minutes each at room temperature. Prepare 2mL of a primary antibody solution in PBS-Tx. See Reagents and Equipment section for antibodies used in this experiment. Replace second PBS-Tx blocking wash with primary antibody solution. Incubate on a slowly rocking platform (~30rpm) at 4°C for 24-48 hours to ensure thorough penetration into the 60μm floating sections. After incubation, the primary antibody solution can be retrieved carefully using a pipette and stored at 4°C for reuse up to two more times within two weeks without any significant loss of staining intensity. Wash sections three times in PBS-Tx for 20 minutes each at room temperature with gentle rotation (~30rpm). Prepare 2mL of secondary antibody dilution in PBS-Tx. Vacuum off the last wash and add secondary antibody solution to tissue sections. Wrap the outside of the staining vial in aluminum foil to block light, which can cause fluorophore photobleaching. Place wrapped vial on a slowly rocking platform and incubate at 4°C overnight. Discard secondary antibody solution by vacuuming away. Wash sections once with PBS-Tx for 20 minutes each at room temperature. Rinse two additional times with PBS (pH 7.4) for 20 minutes each at room temperature. Mount the stained tissue sections onto glass slides using Fluoromount G.
Screen through stained sections for positively infected OSN axons and axon termini with a fluorescent microscope. To construct a three dimensional view of a labeled OSN axon and terminal arbor, make a series of optical sections through the 60μm depth of the target OB tissue slice (along the z axis) using confocal microscopy. This stack of Z-section images can subsequently be projected together to reconstruct a 360° rotating perspective of a single labeled OSN axon, including terminal arbor detail in its entirety. Any one single rotation angle can be captured and exported as an image file (i.e. JPG, TIFF) for 2D format presentation. With the methods described here, we can transduce olfactory sensory neurons by lentivirus in vivo. We have thus far visualized infected OSNs with GFP and mCherry fluorescent reporters, as well with a myc-tagged fusion protein via immunocytochemistry. This technique provides an abundance of infected OSNs. Still, transduction occurs sporadically enough to provide individually labeled OSNs, thus allowing for analysis of single cell morphology. Axons and axon terminals are imaged within OB tissue sections amidst their native environment by confocal microscopy (Figure 1). The entire OSN axon terminal arbor can typically be captivated within a 40-50μm optical section. High magnification of infected OSN axon terminals allows detailed analysis of axonal arbor morphology at the glomerular layer. Figure 1. Trajectory of single olfactory sensory neuron axon and its terminal arbor. A) A Coronal section of the olfactory bulb of a P7 mouse showing the olfactory nerve layer (ONL) immunostained for OMP (red) and the glomerular layer (GL) immunostained with both OMP and Vglut2 (grey). A single olfactory sensory neuron axon expressing GFP (green) travels within the ONL and penetrates into the glomerular structure. B) The axon terminal arbor morphology within the glomerulus clearly highlighted by GFP expression. 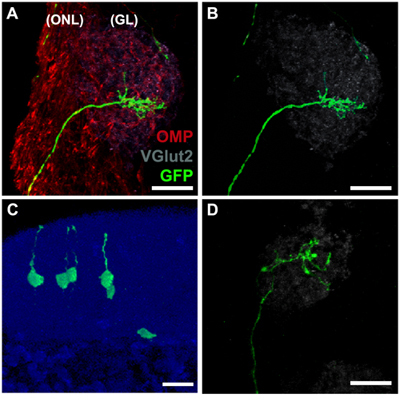 Vglut2 co-staining in grey illuminates the total glomular area within which the GFP-positive axon elaborates a terminal abor. C) Lentiviral infected OSNs expressing GFP (green) in the OE. The cytostructure of the olfactory epithelium is shown with DAPI staining (blue). GFP expression allows visualization of OSN cell bodies and their cellular processes in the OE. D) An OSN axon and its terminal morphology with Rap1GAP2 expression knock-down by shRNA. Lentiviruses carrying a dual expression cassette with Rap1GAP2 shRNA under the mouse U6 promoter and GFP under a CMV promoter were applied to the OE. Infected olfactory axon terminals exhibited a more simplified terminal arbor when compared to that of the GFP only control. Bar = 20μm. Microinjection of lentivirus results in permanent transfer of gene constructs into OSN genomic DNA. This approach allows us to perform short-term or long-term manipulations of candidate genes via overexpression or shRNA mediated knock-down. In addition, we can fluorescently label single OSNs in an existing transgenic mouse line to observe co-localization of odorant receptor populations. Microinjection is required for lentiviral transduction of OSNs. We have attempted flushing lentivirus suspension into the nasal cavity to transduce OSNs without any success. We therefore perform microinjections through the dorsal nose surface in order to deliver virus to inner layers of the OE where OSN cell bodies lie. There are many advantages to using lentivirus over the established adenoviral manipulation. Lentivral transduction integrates into the genome allowing long term studies, while adenovirus gives only transient transfection with a limited timecourse of gene manipulation (Doi et al., 2005). We have detected lentivirally transduced OSNs as long as three months after microinjection. The life span of OSNs in adult rodents is typically between 1-3 months. Lentiviral infected OSNs can thus be visualized through the majority of their lifetime, allowing investigation of OSN axon growth, synaptic formation and maintenance, as well as odorant-stimulated responses and the turnover process. In addition, lentiviruses can infect progenitor cells as well and allow visualization of OSNs for longer periods of time. Adenovirus readily transduces OSNs when infused into the nasal cavity (Zhao et al., 1996). However, adenoviral infection is often widespread from the point of exposure, and does not yield isolated single cell transductions as reliably as lentivirus. Lentiviral-mediated genetic manipulation in OSNs is therefore a powerful and efficient technique for characterization of gene function in single OSNs in vivo. This protocol is bio-safety level 2 compliant. All appropriate workspace, personal protection, and viral waste containment measures have been established accordingly. All animal procedures were performed according to IACUC guidelines. This study is supported by NIH DC052256 and DC006015, and NSF 0324769 to QG and T32-DC008072 to BS. Microinjection: Newborn mice were microinjected using a 5μL Hamilton syringe (Hamilton #7647-01) fitted with a 33 gauge needle (Hamilton #7762-06). Immunocytochemistry Reagents: Primary antibodies: rabbit polyclonal antibody GFP (Molecular Probes# A-6455), chicken polyclonal antibody against OMP (custom) (Chen et al., 2005), guinea pig polyclonal antibody against VGlut2 (Millipore# AB2251). Secondary antibodies: Cy2-conjugated donkey anti-rabbit (Jackson Immunolab# 711-225-152), Cy3-conjugated donkey-anti-chicken (Jackson Immunolab# 703-165-155) and Cy5-conjugated goat anti-guinea pig (Jackson Immunolab# 106-175-008). Sections were mounted on glass slides with Fluoromount G (Southern Biotech# 0010-01) with 50ng/mL DAPI chromatin stain solution. Confocal Imaging: Z-stack images were taken using an Olympus Flouview FV1000 confocal microscope and images collected and processed into 3D projections using Olympus FV10-ASW 2.01 confocal acquisition and analysis software. Chen, H., Kohno, K., Gong, Q. Conditional ablation of mature olfactory sensory neurons mediated by diphtheria toxin receptor. J Neurocytol. 34, 1-2 (2005). Doi, K., Nibu, K., Ishida, H., Okado, H., Terashima, T. Adenovirus-mediated gene transfer in olfactory epithelium and olfactory bulb: a long-term study. Ann Otol Rhinol Laryngol. 114, 629-633 (2005). Lois, C., Hong, E. J., Pease, S., Brown, E. J., Baltimore, D. Germline transmission and tissue-specific expression of transgenes delivered by lentiviral vectors. Science. 295, 868-872 (2002). Zhao, H., Otaki, J. M., Firestein, S. Adenovirus-mediated gene transfer in olfactory neurons in vivo. J Neurobiol. 30, 521-530 (1996).